Newmarket, for reasons that I hope are obvious to any reader, is the most Irish town in Suffolk, and consequently it is also the most Catholic town. 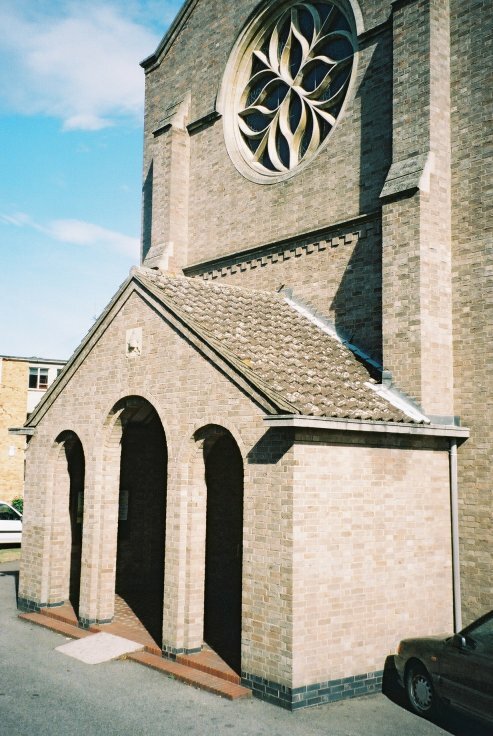 As at Lowestoft, the most prominent town centre church is not the Anglican parish church of St Mary, but the Catholic church of Our Lady and St Etheldreda, a 1970s building that is not without style and detail. On a Sunday it is always full to overflowing, but because this is Newmarket you always get a good view. 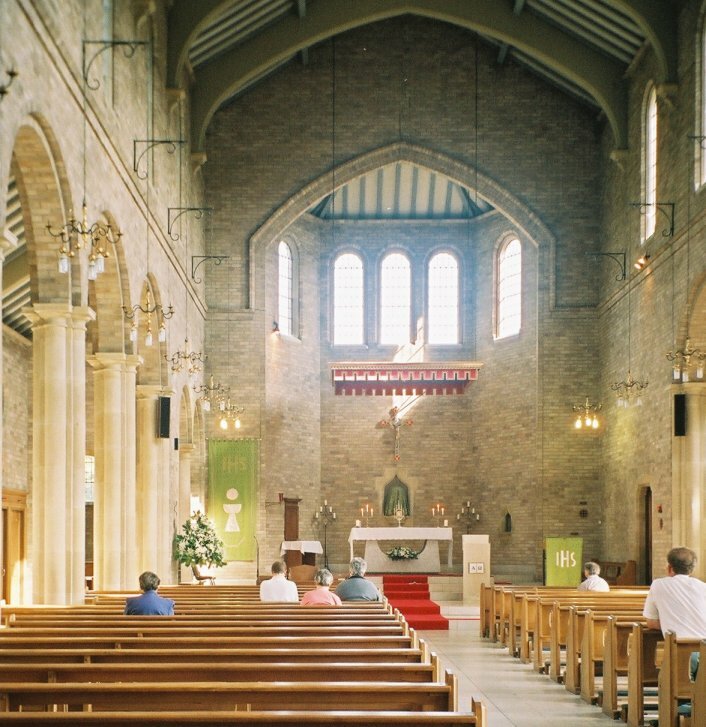 The Catholic Church realised quite early that it had work to do in this parish, and a convent, school and chapel were established on the Bury road during the 19th century, dedicated to St Louis. They are still there today. 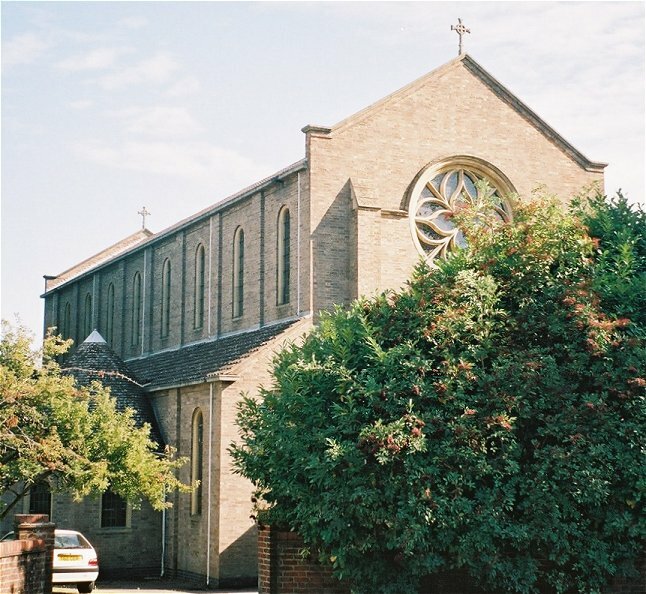 In the 1990s, when the economic boom meant that Newmarket town centre was thriving and land prices were rocketing, the Parish considered selling the site of St Etheldreda and moving the church back out to the Bury road site. However, a referendum was held among the parishioners; this option was defeated, and rightly so, for the visible presence of the Church is an important one. Although the most familiar view of St Etheldreda is the great east window seen from the clock tower roundabout, the entrance is at the west end, through a narthex porch. Glazed panels allow a view into the church, and when I was here on a Saturday morning in September 2003 the church was busy with people praying before the exposition of the blessed sacrament. The car park outside was packed, but I guess this is probably parishioners privilege for shopping. 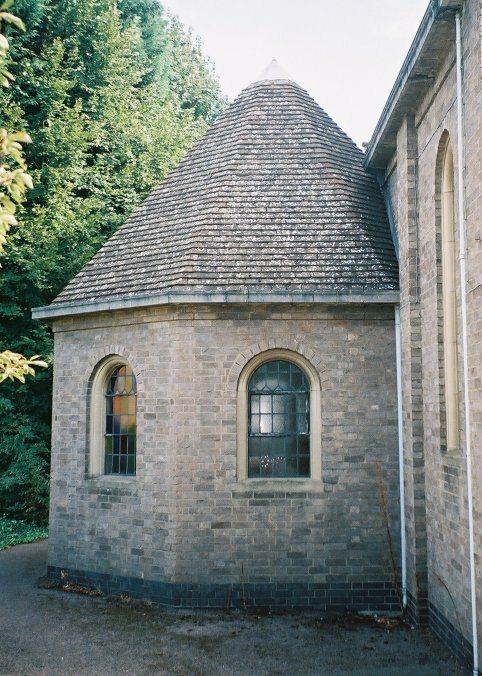 One interesting outside detail is the little baptistery set in the north-west corner, a kind of brick-built echo of the one at Bungay. I was heading for the former Newmarket workhouse chapel, so I cut up Exeter Road, which you cant do in a car. This is a delightful conservation area in the middle of the town, attractive 19th century terraced houses are interspersed with stable yards. I thought that it must be a lovely place to live.